Status: Active. BCGS Cemetery Records updated October 26, 2008. Lakeside Cemetery is located in section 20, on the east and west sides of Lakeside Road off Red Arrow Highway. The older section on the east has no known records of lot purchases, burials or maps. It is surrounded by a golf course on three sides and is approximately 4 acres. The lanes are paved and water is available. There are many wonderful headstones found in the rolling hills of the cemetery. This side is full and to be buried there a space must be already reserved. The west side is approximately 2 acres and has been township owned for many years. The lanes are not paved at this time. Some written accounts claim that John Wesley Wilkinson owned the land and he donated the land as a cemetery. In 1857, Abram Burner Wilkinson (son of John Wesley Wilkinson) and Daniel P. Hibner laid out the land as a cemetery and ironically, they would be the first to be buried there. Daniel P. Hibner died on October 24, 1858 at the age of 41 years. Abram Burner Wilkinson died on March 10, 1859 at the age of 25 years and 5 months. John Wesley Wilkinson is also buried in Lakeside Cemetery. He died on October 15, 1892 at the age of 91 years, 6 months and 28 days. In 1975, David Savage transcribed Lakeside Cemetery and he received historical data and support from Ruth (Robinson) Carr. 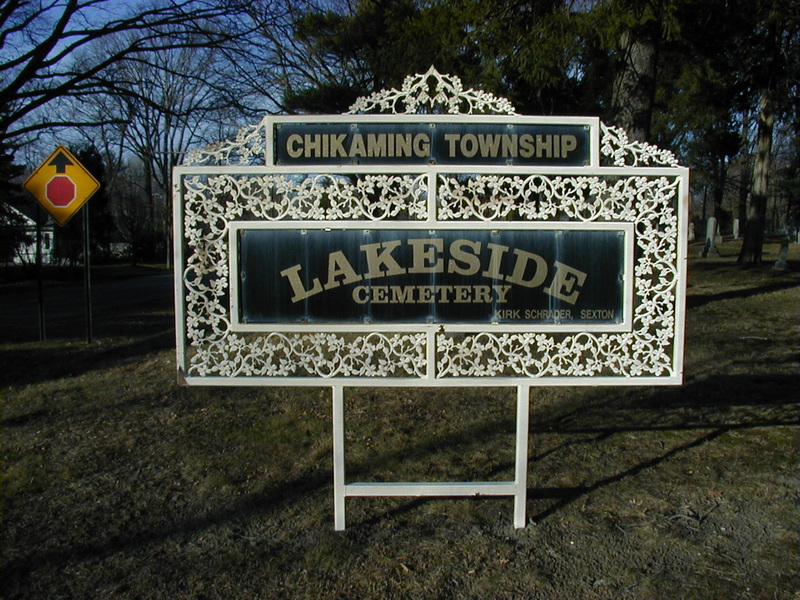 With both Lakeside Cemetery and Riverside Cemetery, also in Chikaming Township, they found approximately 2, 759 burials. The Chikaming Township Hall has master maps, which show the lot purchases for Lakeside Cemetery. Kirk Schrader has been the sexton for the past 18 years and has a ledger with recorded lot purchases starting in the year 1908. Many interesting people and early settlers are buried in Lakeside Cemetery. Richard Peckham came to New Buffalo in 1842 where he opened a factory, which manufactured rakes and grain cradles. The following year Richard purchased land in section 20 of Chikaming and also held office for the Township of Chikaming as a Supervisor in 1857 and 1870. From 1858 to 1860, he was the Clerk for Chikaming Township. Alfred Ames purchased 78 acres in section 30 of Chikaming Township in 1844. He married Mary Fisher who was a schoolteacher. In the year 1847, it was at the Ames’s house that 9 children were gathered and the first school class was held, with Mary as the teacher. Mary was also considered a celebrity for her poetry and prose that was published in newspapers and magazines. The home of Alfred & Mary Ames was located on the shores of Lake Michigan and was known as “Clay Banks”. It’s interesting to note that Alfred Ames, Samuel Stoddard and his wife Naomi all died of small pox March 4, 1864. Freeman Pulsifer held the title of Chikaming Township Treasure in 1859. John C. Miller was a member of the House of Representatives of Michigan in 1862. John held office for the Township of Chikaming as a Supervisor in 1858, 1861-62 and 1867-68. About 1850, in section 30, Amos Fisher located a farm where he and his wife resided starting in 1853. Early in 1853 a schoolhouse was built on Amos’s land where John Wesley Wilkinson’s daughter Martha taught school in the summer of that year. John Wesley Wilkinson came to New Buffalo in 1847. Joseph and John Wilkinson purchased twenty-five hundred acres of land in Chikaming. They went on to build a six hundred foot pier, a steam sawmill, Greenbush Pier and Pikes Pier. James Abner Wilkinson held office for the Township of Chikaming as a Supervisor in 1866. A.B. Wilkinson held the title of Chikaming Township Clerk in 1856-1857. Lydia Wilkinson and Ethel Edmonds put together ‘Mothers and Others’; a group who sponsored hot lunches and school activities. A post office was established 1858 and Abner Clark and John Wesley Wilkinson were two of the three postmasters. After completion of the Chicago and Michigan Lake Shore Railroad, new post offices were established. James Spaulding was the postmaster at the Sawyer post office at Troy Station, and the postmaster of the Lakeside post office at Wilkinson Station was John S. Gibson. John F. & Franklin Gowdy came from New York. Catering to the Chicago market, Frank was deeply involved in the lumber and wood industry. The Gowdy’s built a sawmill and pier in what became Union Pier. The mill was in the possession of William Gowdy who was running it as of 1880. Frank Gowdy was Chikaming Township Clerk for the years 1863-65 and 1867-68. Herbert Gowdy worked on the resort development of Union Pier. On August 7, 1869, Mrs. J. A. Wilkinson, Mr. & Mrs. W. A. Gowdy and Mrs. John Gowdy organized the Union Pier Baptist Church in Union Pier, along with other folks, which made up the 13 members.